* Wood Framed Buildings only become vulnerable to complete fire consumption as the walls, floors and roofs get sheeted in. 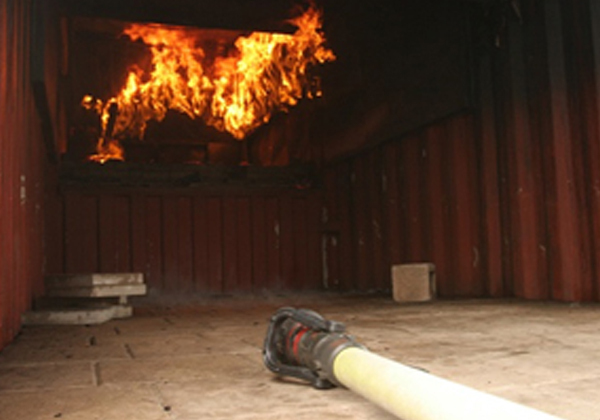 Framed walls without sheeting are not vulnerable to complete fire consumption. *The fires that have been consuming wood framed high density buildings that could have been set by plumber & welders torches, cooking devices or arsons always start low in the walls that are sheeted with OSB. * In order for fire to survive and accelerate its has to have fuel i.e. lumber, a heat source, oxygen and the carbon monoxide its creating has to be left unobstructed. * As the fire has to move away from the original ignition location in order to survive its has to find new oxygen and new fuel so it starts to climb the wood stud sheeted with OSB heading up not down. * As the fire climbs and heads up its creating vertical momentum and accelerated heat temperatures and with that the gases start to fill the floor ceiling assembly when the floor is sheeted. * As the floor ceiling sheeted assembly pushes out the oxygen and the gases fill that assembly while the fire is heading up the stud and sheeting when the flames hit the horizontal sheet floor assemble and the temperature reaches 900 degrees flash over begins to create a whole new pace of that fire that started small low in the wall. * Typical high density buildings have 9’ walls and the fire can get to flash over mass in less than 5 minutes. * By the time a fire is recognized and reported to the local fire department its usually after flash over. * Fire Trucks and Fire Fighters understand flash over events in wood framed buildings under construction better than anyone. This means by the time they get on site they have already made the decision that they are not going in and they can only defend the building with boom cranes to defend the neighboring buildings and houses. So who is to blame for all the fires in high density wood framed buildings today? * Its surely is not the Fire Fighters they have been crying out to the building industry for years. * Its not the lumber producers fault we need OSB and I joist and todays Juvenile lumber in order to support our housings starts and economy. * Its only now after the Denver Fire that killed two construction workers that its becomes the Builder,, Architect, Framing Sub Contractors fault. Its not the lumber producers fault if you use raw vulnerable lumber without fire protection. * Is todays EWP, OSB and Lumber the reason and fault for these complete fire failures? Yes they are more vulnerable than old growth lumber and Plywood but its not the producer fault we in the building industry that have any part of vertical framing is now to blame after Denver when its comes to making wood framed buildings safer for the workers from fires on job site during construction and before drywall and sprinklers are in place. * In the picture below as those walls sheet and enclose that building is capable of complete fire failure even if its just a room addition or single family house. This new fire knowledge now make all builders responsible for workers safety. * Turn Key Framing Contractors are at risk of liability if a fire consumes and building especially if it hurts or takes any worker life. The Framing Contractor can mitigate risk by suggesting fire protection on 100% of the lumber. If the builder refuses to pay the cost to defend the wood structure as its being framed all the contractor has to do is have the sign off that they refused to pay for making the job site safer. Same goes for smaller contractor suggesting fire protection to homeowner even on a room addition. Its todays USA Building Industry and new cost effective clean fire protection is available to all job site. This new fire protection is sprayed on 100% of all the interior lumber as its being framed and sheeted over so the buildings is not as vulnerable as hoping it will never happen on your job site. So how does this new clean fire inhibitor work verses the old pressure treated lumber?
. The old school methods of pressure treating lumber made the cost double so its only used primarily on exterior walls in some buildings. Those fire treated walls do NOTHING to defend a building during construction from complete fire consumption because the 90% is raw fuel that will rip right threw a fire treated wall.
. The new school to spray fire inhibitor on 100% of the interior lumber cost 1/4 of the cost to build and entire building with pressure treated lumber. This new fire inhibitor technology is equal to or better than pressure treated lumber in its E84 extended test results. This fire inhibitor job site spray is not trying to compete with pressure treated because the job site spray will not meet the FRT code because its installed on the job site.
. How does this clean fire inhibitor job site spray work? As fire try’s to gain momentum up a studs to head into and enclosed floor ceiling assembly to create its flash over moment this chemistry breaks the back of it momentum. So as the fire creates gases that fill the over head enclosed assembly the clean fire inhibitor clinging to all the interior lumber breaks the chemical reaction. By breaking the chemical reaction we take the strength and momentum out of the fires advance. Should The Risk Management Side Of High Density Wood Framed Buildings Consider This New Method Of Making Buildings Safer For The Workers? If they don’t they are subjecting all the workers to undo risk and the investor money to future law suits. Should The Insurance Industry lower risk premiums for builders that mandate this new way to defend wood framed building from fire to make them safer for workers will soon be seen in the USA building industry. Note: Today in the US Building Industry some builders have mandated the use of this new fire inhibitor on all there wood framed buildings going forward.